Gmail is the most precious gift for the people provided by Google. It is the best Email Client in the world and this is the reason we all are well familiar with the usefulness and work perfectness of Gmail. You can notice one thing that Gmail never add all those additional functionalities which are already being used by so many other email clients or people can get easily from other apps. Gmail only allows all those extensions or third party apps which are much useful for the people and follow the Terms & Privacy of Gmail. Gmail has already included the Undo Sent Email feature which is very much helpful for the people. But people want complete control over the sent email and to fulfil the wish of people a Chrome extension for Gmail is available named docTrackr. docTrackr is a Chrome extension for Gmail developed by www.doctrackr.com. It allows users to remotely track access or remotely destroy Gmail attachments. 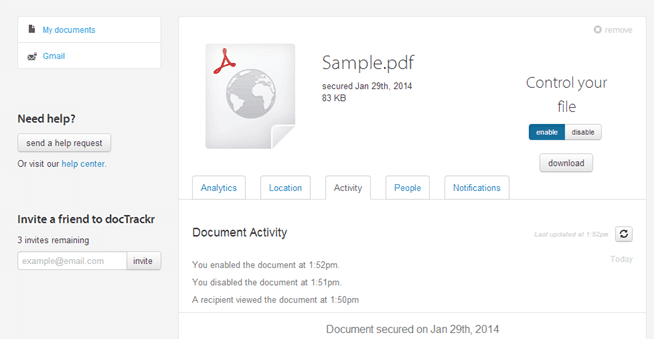 Users can also set view, print and copy permissions to each and every PDF attachment for inhibiting any misuse by their recipients. In simple words we can say - docTrackr is a complete document Control Software which is perfect to Secure Gmail Attachments. To get started with docTrackr, firstly you will have to install the docTrackr extension on your Chrome browser. 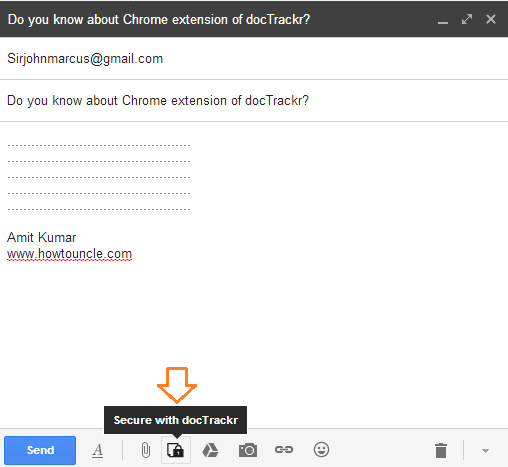 After installing successfully, login to your Gmail account and open compose message window where you will be able to see a secure attachment button (known as Secure with docTrackr) just next to the default attachment icon as shown in below screenshot. By clicking on this button you can send the file with your desired permissions preset. When you will click on the button of ‘Secure with docTrackr’ for the first time, a sign up form will appear requiring your email address and password for creating an account with the service. 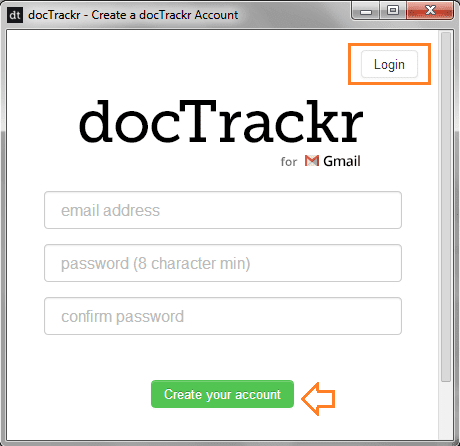 And all those users who already have an account of docTrackr they can use Login button to sign in. Note: In present time docTrackr is supporting secure delivery only for PDF files, but the developers are assuring that the support for additional document formats is coming soon. After attaching the file, when you will click on the Send button in the Compose window then a small pop up window will appear where you can easily specify the access type through the check boxes. From here You can set various permission types for each and every attachment such as only view, print and view, or print and edit etc. ‘Can View’ option is always selected as default. For the example a screenshot is shown below. You can also set an expiration date for the attachment just by clicking the given calendar field. This is a very useful feature to show your attached file till a specific date to recipient. After completing all type of permission set ups, finally click on "Secure & Share" button to send your message. One of the most interesting features with this extension is that you can easily track everything related to your attachments from your docTrackr dashboard such as when the email is viewed, file accessed, or downloaded by the recipient. You can get the location information and activity whenever your document will be accessed by the recipient. You can also enable or disable access to the document manually. 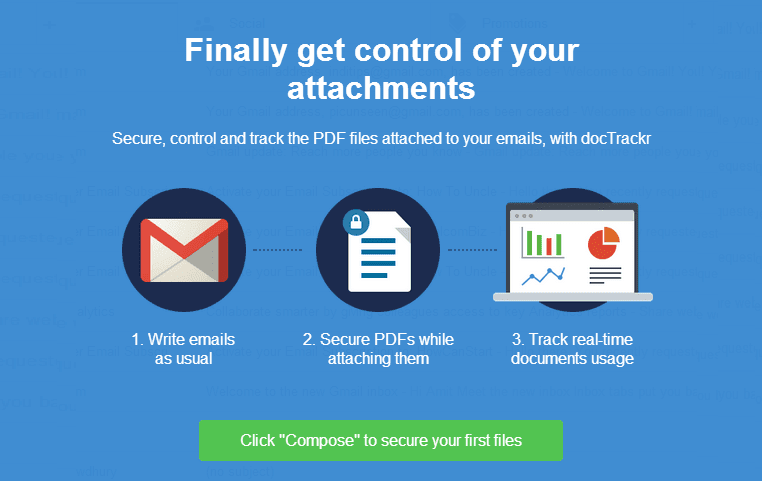 I hope you enjoyed the above mentioned tips and tricks to Secure, control and track your sent Gmail attachments using docTrackr. Feel free to share your view with us through the comment about its amazing features.